Winter Pines • Finished! | OccasionalPiece--Quilt! 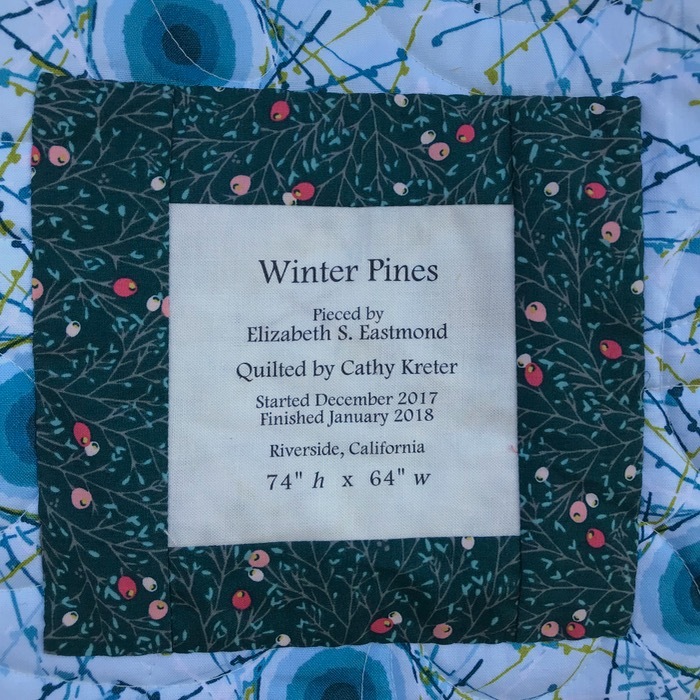 Posted on February 6, 2018 by Elizabeth E.
You saw the sewing of Winter Pines and I’m back to tell you it’s finished. The backing is an oldie from the stash; I deliberated whether or not to use it as I was “saving it for just the right quilt” but am so glad I decided to use it. 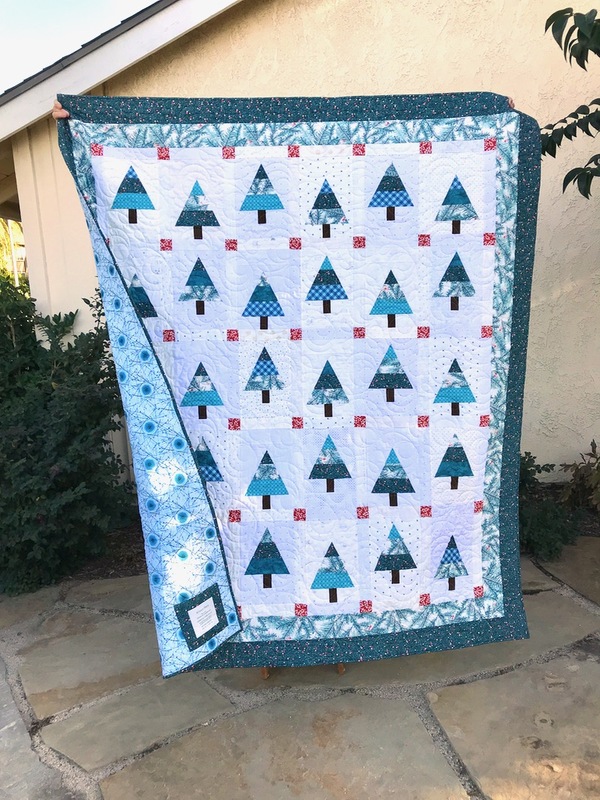 I love it with the wintery theme of this quilt — just the right colors. 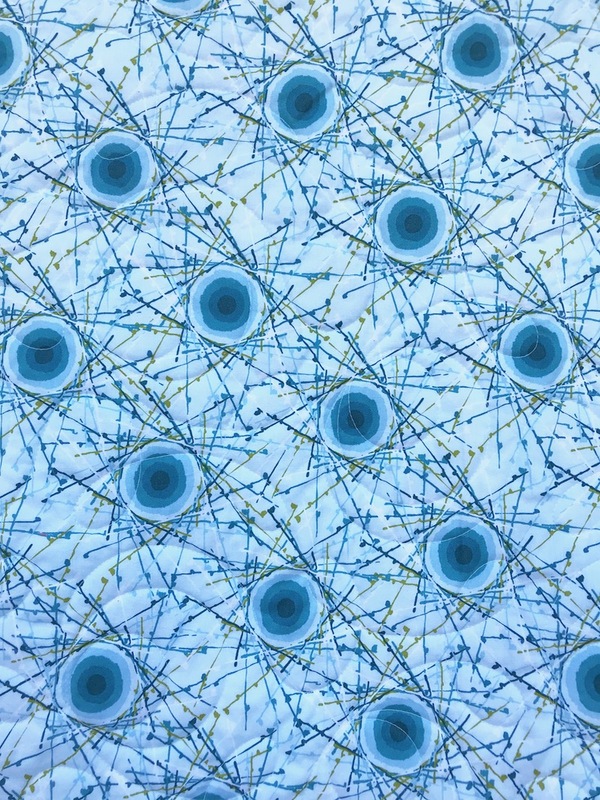 My quilter did a great job, using one of my favorite edge-to-edge patterns: a swirling loop-de-loop. I’m sewing the binding on another quilt that I’ve kept under wraps for nearly six months. It will hang in a booth at QuiltCon, so the time is getting closer to showing you all, but first I have to make the label and get that sewn on. Soon, very soon. PS: Very windy day to photograph a quilt. 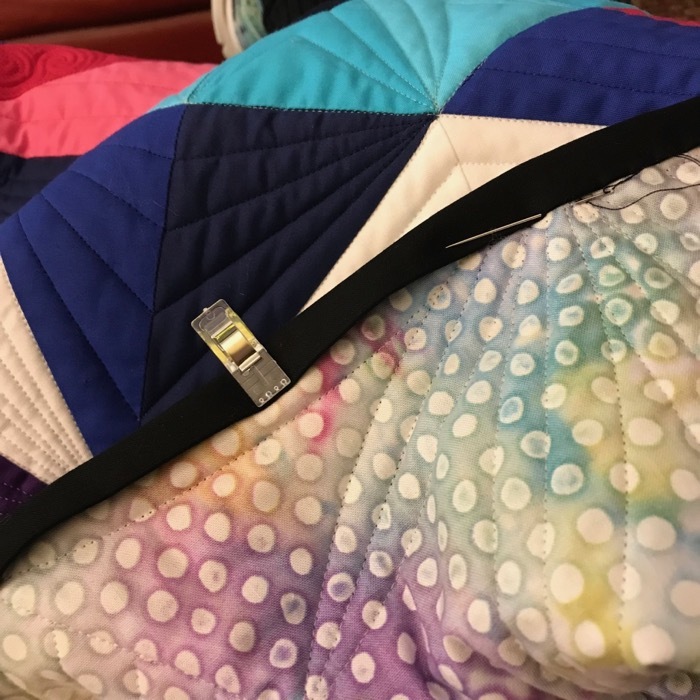 I really love this quilt – it turned out great and so glad to you used that “saved” backing! Living in the woods, tree quilts always call my name. And cannot wait to see what you’ve made for QuiltCon! Wonderful! I love this quilt. Thanks for sharing your quilts and your expertise. Congratulations on the finish and near finish. I look forward to hearing more about your secret sewing! I’ll be looking for the mystery quilt at Quilt Con. 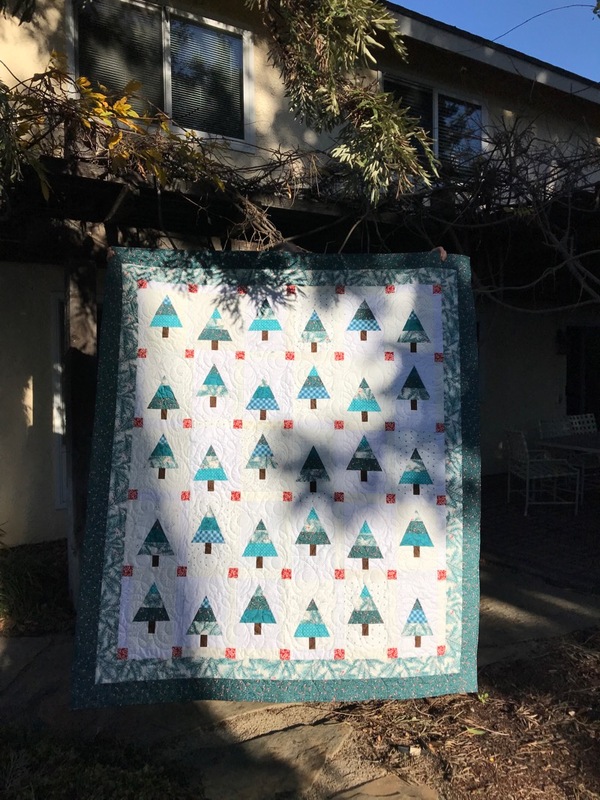 I love the fabric choices for Winter Pines. Where have you been hiding those Lollypops! I love the quilt and you know how much I love appliqué. I need to find that pattern. Such a nice finish and a nice quilty pattern too. Makes me realize I haven’t touched my pine tree quilt in weeks. Too many other projects had priority. If I don’t hurry up it won’t be very useful for what’s left of this winter. Then it will have to wait for next Christmas/winter to be put to use. It is beautiful, Elizabeth. I love the red cornerstones you chose for it. Looking forward to seeing your quilt at Quilt Con. Super cute! I need to make one of these! Lovely quilt finish, Elizabeth. You are a prolific quilter, for sure. One month from start to finish, that’s awesome and the quilt is such a great winter pattern. I love how those little red squares pop out. Very nice touch on another beautiful quilt. 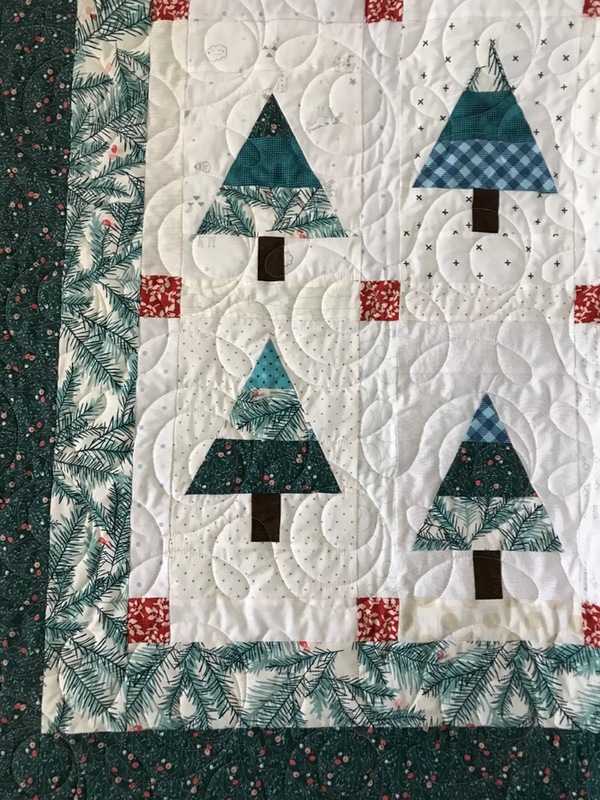 The backing is perfect for your wintery quilt Elizabeth! You did save it for the right one after all! Excited to see your QuiltCon contribution too! 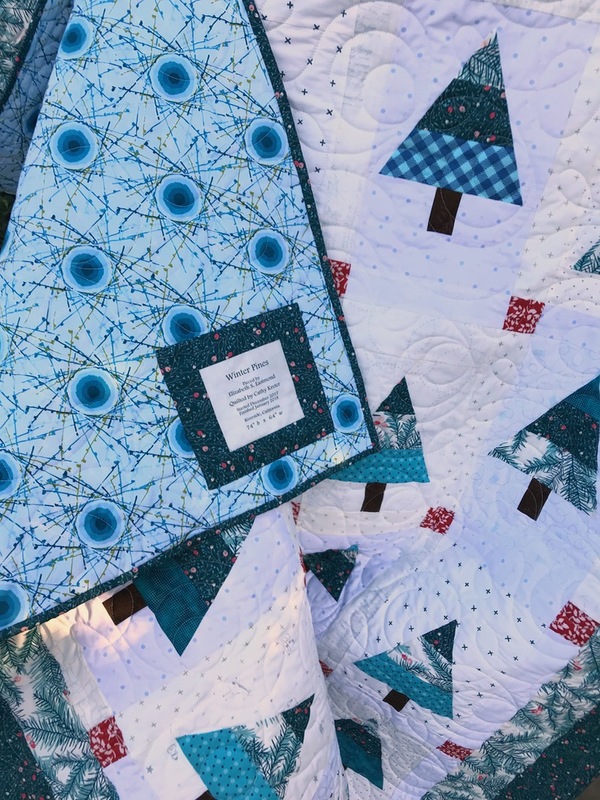 This is such a great winter quilt, as well as fabulous backing. Glad to hear one will be in QuiltCon even though you wouldn’t show it yet. And I agree, the trees finished up great! Super cute! That pattern is definitely on my to do list!